Sous vide is a popular cooking technique that has gained favor in Washington, D.C. restaurants and homes over the last several years. For many reasons, it is an ideal method for producing a wide range of high-quality dishes that are limited only by the imagination. Its literal translation from French means “under vacuum,” and the process involves placing foods in airtight bags and then submerging those bags in heated water. This eliminates the need for food to be directly exposed to a heat source, which can lead to a less steady cooking environment. But what are the benefits of sous vide? When you cook sous vide, you can literally seal in all the pleasure. Juices and aromas will be concentrated inside the bag during the cooking process, and there will be a greater concentration of flavor. Exposure to direct heat sources can lead to damaged and overcooked food. Damaged and overcooked food can lead to food waste. Sous vide eliminates this possibility. When you cook and store food in the same water, the potential for oxidation is eliminated. This makes it easier to store food for later use. Sous vide cooking equipment comes in both professional models for restaurants and foodservice applications, or it can be purchased for residential use. Find out which grade of sous vide equipment will work for your applications by visiting the new Alto-Hartley showroom. We’ll even give you a 10 percent discount on your equipment purchase. Looking for sous vide equipment? 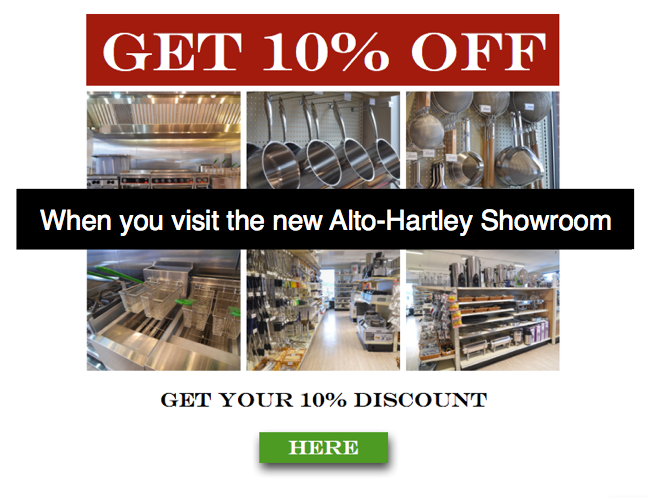 Take advantage of our special showroom discount.